This is a complex, well-conceived, who done it. Lots of suspects, but only one killer. Which one is it? Will it be the first person who looks guilty? Not if former cop Steve has his say. He’s determined to find the real killer and almost dies for it. Having too many potential murders can be as frustrating as not having any. As they work their way through the potential killers, they come upon quite a few secrets and betrayals that had nothing to do with the murder—just rocks overturned on the journey. What I really enjoyed was even with a large cast of characters, time was taken (in an entertaining fashion) to flush them out into three-dimensional characters. Lots of peeps to love, like, and dislike. But which is the killer? That’s your task to discover. I had locked in on the one I thought guilty, but I was wrong. See if you can figure it out before Steve & Sarah & et all do. Check out the review here or read it below! ​In The Missing Mah Jong Player, by Iris Wynne, divorced Marilou is looking for love in online chat rooms. She has been very busy with her dates and other commitments, that she hasn’t really had a lot of time for her mah jong group. So when she misses a day after confirming she would be there, Harriet (friend and fellow mah jong player) begins to grow worried. She goes to her house and discovers that Marilou is missing. When the police make no headway into solving the crime and are giving up, Harriet decides to hire a private investigator, Steve Wade. Wade is an ex-policeman who at first doesn’t want to take the case. After much arm twisting and free cupcakes from Harriet’s bakery, he complies. But Marilou’s disapperance raises a lot of hard questions. Was she killed? Did she willingly leave? Was one of the guys she was dating responsible for her disappereance? Or was the criminal someone much closer to her? Not only is Wade investigating a hard case, he also has the five remaining mah jong players intent on helping him discover the truth. From staging a speed dating dinner, to questioning family and friends; these ladies and Wade are hot on the trail. When you read the synopsis of the book it is very centered on Steve Wade and sounds like a modern Philip Marlow or Sam Spade type of detective fiction. I am not sure if the author changed her direction while writing, or is hoping for a Steve Wade series, but that is not the case. Instead of being solely focused on the private investigator the story is shown through the eyes of Wade, Harriet, Sarah (mah jong player and Wade’s new secretary), and Candy Kane (stripper turned private investigator). I believe this actually improves the story as it transforms it into being more than just a mystery, but also how a loss affects people and what they do to deal with their grief. Everyone’s reactions to Marilou’s disapperance range across the board. You have some of her friends in denial, believing she just ran away; some who don’t want to think on the issue and are intent on forgetting it as it is a matter for the police; Sarah who won’t stop crying as Marilou was a mother figure to her, and Harriet who needs closure and answers so she hires a detective. Not only does this more personal approach make a stronger story, but it really helps you connect to the characters. This also causes you to really care for Marilou, as all these personal reactions make her into an actual person instead of a “body” or “victim #1”. Steve Wade was a great character as well. He was intelligent, imaginative, analytical, and able to solve the mystery after a series of time. I liked that it wasn’t instantaneous but methodical, and that at times Steve would sometimes miss what was right in front of his face as he was too heavily concentrated on another aspect. He is also a perfect compliment to his surrounding characters. I hope that this will be turned into a series and that we may see more Steve Wade in the future. As for the mystery it was pretty compelling. We at first have the question of whether or not there is an actual crime or if Marilou just left of her own accord. Then when it is established as a murder we have a long list of motives and suspects; everyone from Marilou’s cousins, friends, men she was dating, to even her children. It progresses realistically and the only complaint I have was that the end seemed a bit rushed as they present the resolution. I thought this book is fantastic and the perfect addition to any mystery lover’s bookcase or kindle. Mystery, Food, and Friends---A Fun Summer Read! Friends, murder, mystery, cupcakes, pizza, and a touch of romance---it's all in The Missing Mah Jongg Player! Not many authors can relay the true dynamics of friendships. Ms. Wynne did. As I was reading, I felt as if I sat in the room discussing ideas of potential suspects right along with the group. I can totally relate to so many aspects of the delightful characters---fits of tearful giggles to game night with pizza. I truly enjoyed this book and look forward to more from the author. Entertaining and fun to read. The Missing Mah Jongg Player is an entertaining, and fun to read mystery with a little romance on the side. The storyline is topical with the current popularity in online dating. The author, Iris Wynne is adept at drawing the reader into the story quickly, and creates interesting characters that the reader can relate to, and wants to know more about. I recommend this novel. While I don’t usually read police procedurals, I’m glad I make an exception for The Missing Mah Jongg Player. Ms. Wynne has skillfully blended action, suspense and romance in this well-paced novel filled with enough twists and turns to keep us reading well into the night. Congrats on an excellent debut! When Marilou Dickson disappears after a blind date with an online acquaintance, it’s her Mah Jongg club partners who sound the alarm. When the Toronto PD lets the case get as cold as their Canadian winters, Harriet, Sheila, Lynne, Audrey, and Sarah refuse to give up. Harriet hires Steve Wade, a middle-aged, good-looking, capable but disorganized P.I. to investigate the cold case. With the ladies’ assistance, an arrest is finally made, but is it the right man? Steve isn’t convinced and keeps investigating a long list of neighbours, relatives, old boyfriends and acquaintances. The experience somehow reunites him with a brother, an old colleague, and an ex-stripper-turned-investigator girlfriend. This enjoyable and unique plot had a lot going on with a plethora of characters. Not bad for a break-out book from a first-time author! Where it suffered was from a lack of editing in several areas, such as numerous random POV shifts throughout the story, wrong word usage, overuse of passive voice and clichés, discrepancies, and believability in the ending. The majority of these are things writers notice rather than readers, so if none of these situations are a bother, there’s plenty enough here for an enjoyable day of reading. This is more fiction than a romance, though it did result in a few budding relationships by the end of the story. It’s got all the makings of a continuing series with its huge character pool to fish from, and nothing improves writing skills like writing more books. So good job and keep writing, Ms. Wynne! His newest client is a man charged with a murder he says he did not commit. The convict’s sister has evidence that the person he supposedly murdered is alive and living somewhere in Shanghai after an old classmate of hers sees a double of the murdered victim while touring parts of Asia. It’s a dilemma he must think through and to try to prove the convicted murderer’s innocence. When a women long believed dead is spotted in China by an old friend on holiday, it opens a real can of worms. If she is indeed the woman believed murdered, than her drug dealer has been falsely imprisoned and there is a dead body who’s identity still needs to be discovered. With the sister of the accused pushing for involvement to free her brother, and the family of the “deceased” wanting the dead to remain dead, it turns out to be a real muddle. With such uncertainty there is only one thing to do, hire someone who can look into the matter: private investigator Steve Wade. Since Wade solved the case of “the missing mah jongg player”, has become a hot commodity and is asked to check out the case. But is the deceased, Patricia, really alive, or is it just a look-a-like in China? And if she isn’t dead, who died in her place? Did the drug dealer murder this Jane Doe, or was it someone else? I thoroughly enjoyed the first book in the series, The Missing Mah Jongg Player, which gave me high expectations for the sequel. Wynne didn’t disappoint with a cleverly crafted mystery that takes murder into mistaken identity and even further into assassins and a cover up. We also have a return of the characters we enjoyed from the first novel; such as the intelligent, imaginative, analytical, and methodical Steve Wade; Candy the stripper turned private investigator, who is still coming to terms with her insecurities and the shadow of the past; and sweet Sarah, Steve’s secretary, who finally gains confidence and the ability to assert herself. The only problem I had with this novel was that the secondary characters were not as well done as in the first book. In The Missing Mah Jongg Player, the other mah jongg players created a more personal connection to our missing person causing the viewer to see her as a person rather than a “victim”. Their different personalities also balanced well with Wade’s logical approach. In this book our new cast of characters were interesting and developed, but not as fun or colorful as in the first. 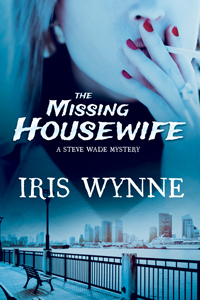 Great writing from Iris Wynne! Having not read the first book in the series The Missing Mah Jongg Player I wasn’t sure what to expect but the title intrigued me. I really like the cover of the book and wasn’t disappointed when I started to read. Even though it is part of a series it is still a good stand alone story. It is very well written, showing skilful crafting of a murder mystery. It has a very clever plot. Is the victim still alive, or is it a double, mistaken identity, is the accused actually innocent, so many twists and turns. It kept my interest and focus; the characters were gritty and well drawn. The dialogue was believable and the settings and location vividly described. Iris Wynne can certainly tell a good story. I feel I got to know Steve, Candy and Sarah really well during the story and will certainly look out for more from Iris in the future.